As I explained in another review, I love removable helmets on 3 3/4" figures, from the oldschool minimalism of M.A.S.K. to the slew of modern Star Wars figures that can all doff their caps. Thus, as you might imagine, I was really looking forward to GI Joe's "SpyTroops" line. A sniper needs to control the high ground, but he also has to have the means to get there totally unnoticed. Barrel Roll uses specially modified Cobra personal gliders combined with Cobra battle armor to penetrate enemy territory. Barrel Roll jumps from a plane at an extremely high altitude, above enemy radar range, and free falls with an oxygen mask. At the last moment, he deploys his glider system and flies low to the ground below enemy radar until he lands at a suitable position where he digs in and stays motionless for up to three days before he takes his shot. Barrel Roll has been practicing all his life to be what he is. Even as a kid, he could stay stock still for such long periods of time that teachers would think he was sleeping with his eyes open, until he blinked and faithfully repeated everything that had been discussed in the class. He was a whiz at math, which is essential for calculating trajectories. Barrel Roll was the absolute best at anything that had to do with accuracy. The idea behind the line is that Cobra and GI Joe both have operatives trying to infiltrate the other organization. In the world of GI Joe, this does not involve trying to recruit the other's agents, but rather putting large pieces of armor over your usual garrish costume. Go figure. Barrel Roll is one of the best-looking figures Hasbro has yet released. He doesn't have any of the body proportion problems faced by earlier figures; his lower legs look a bit thin, but even that is a minor complaint. He moves at the neck, shoulders, biceps, elbows, wrists, waist, hips and knees. One of the first new characters created for this revamped line of toys (which we'll call "Generation 2," in deference to our many Transfans), Barrel Roll had no previous version to which to be compared. He's listed as a "high altitude sniper," and is wearing the sort of HALO gear suited to his title. His flight suit is two-tone blue, with the GI Joe logo on one shoulder and a serial number - 070602 - on the other. He's got his sleeves rolled up and is sporting black gloves. Barrel Roll gets his file name (and birthplace!) from the lead designer for the 3¾" line, Dwight Stall - and it turns out he gets his face from him, too. Granted, you can only do so much with the sculpt on a figure of this size, but Barrel Roll joins Tunnel Rat and several others as a Joe with real-world inspiration. Admit it: if you worked for a toy company, you'd try to get yourself turned into plastic, too. While most of the SpyTroops sets include two figures - one Joe, one Cobra, and a disguise for one of them - Barrel Roll is one of only three sets that include a single figure. Rather than an enemy to fight, he comes with a large accessory; in this case, it's the Air Assault glider. The GI Joe team's high-altitude sniper, Barrel Roll, must take the newly developed stealth glider and infiltrate the mountain headquarters of Cobra. Getting past the sensors won't be easy, so the glider is equipped with SpyTroops gear to make the glider look like a Cobra flying jet backpack. Once Barrel Roll gets within range, he must launch his missiles at the unguarded Cobra motor pool, ruining any chances of a Cobra sneak attack! The glider has a 10" wingspan and is sculpted with all sorts of technical details. A gatling gun rests in the center, there are two removable missiles under the wings, and even a crossbar for the figure to hold onto. Since the "glider" is designed to look like metal, it also has air intake and exhaust valves to help scoot it along. Infiltrating Cobra airspace requires a disguise, though. Barrel Roll dons chest armor, a masked helmet and two gauntlets to conceal his patriotic identity - apparently he's supposed to be a Raptor-Viper. The pieces are grey with red highlights, and look quite natural once he's got them on. The pieces for his arms are a bit unclear at first, but as long as you align them with the backs of his hands, you'll be okay. The glider undergoes its own transformation to help sell Barrel Roll's new evil identity: the wings detach from the sides and plug into the slots underneath the body previously occupied by the rockets; two new rusty red cobra-shaped missiles fit on the sides, and a large Cobra insignia snaps onto the top. 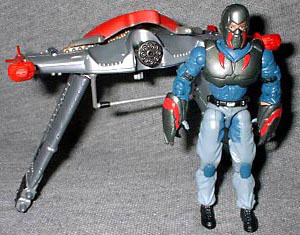 Both the figure and the glider look unique in their disguises, but if that's an example of typical Cobra aeronautical engineering, it's no wonder they always lose. 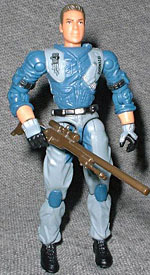 There's another figure out there with a connection to Barrel Roll: a Cobra sniper, Blackout, is listed as his brother. They have the same last name, and even the same hometown - how much do you want to bet he's based on Stall's real sibling? So far there's no sign of the sister mentioned on Blackout's filecard; we'll just have to wait for Cadet Bombshell.